How conservative publishers and authors risk killing off books and chapters across university social sciences and humanities. Image credits: CC0 Public Domain. Four years ago, drawing up my reading lists for the new academic year, I realised with a start that I had almost stopped setting books altogether, in favour of journal articles. The reasons were simple. Students at the London School of Economics are demanding ‘customers’, with a huge appetite for work, a serious commitment to doing things properly, and (on the MPA programme where I teach) lots of career and work experience already behind them. Hence we long ago had to radically upgrade all our facilities for them. And for reading lists that meant they were no longer issued on paper but held on Moodle, our electronic ‘Learning Management System’. If I cite journal articles on my reading list, my students would have instant one-click access from Moodle to the PDF copy. They could download them to their PCs for study wherever and whenever needed, and keep them permanently in full text form beyond the seminar week, using the PDFs for later essay writing and revising for exams. In addition, the whole class could access and read the same materials simultaneously. And I can add journal articles right up to the last minute in digital on-demand form. By contrast, if I cite a paper book (and they were almost all paper-only four years ago), none of this was feasible. I would have to ask our exceptionally busy and talented MPA students to spend hours chasing around the vast LSE library in search of elusive paper copies of books. Even for key references, they would have to wait for access to one of the necessarily limited number copies in our teaching collection. Certainly the whole of six seminar groups for my courses could never access the same books at the same time. We would do our best with electronic study packs, but they could only cover one chapter per book for copyright reasons and they took our Library months to prepare. You could not have any last-minute thoughts on what to put in the e-packs. As in so many other industries and areas of our social life then, the competition of ancient, pre-digital forms of products with modern digital forms was inherently uneven from the outset. And for a long time it got worse as time went on. The outcome was foreseeable and known to everyone in the publishing industry and in academia decades ago. But the conservative book publishers were determined to follow the music industry down the path of digital denial for as long as they possibly could. Partly this reflected some genuine intellectual property rights (IPR) anxieties, but partly also an entrenched commitment to existing ways of doing things. Even for textbooks and the ‘intermediate texts’ often used in teaching more advanced courses, publishers for a long time came up with digital ‘offerings’ that were hopeless in their useability. The text was digital all right, but you had to read it live on screen, and it was ponderous to navigate, often because of pointless ‘frames’. You could not quickly scan text, and although you could sometimes print bits, you could never save it or annotate it. I can think of several different useless digital formats, where even if you set the textbook students would legitimately complain about its poor functionality. Yet academics also were into digital denial in a big way, especially in the humanities and softer social sciences. Here books remained a main medium of scholarly communication. And often in these areas referencing practices have been so poor for so long that very many journal articles were not cited by anyone – especially in the humanities. Hence academics were mad keen to hang onto books, as the only things that get (lightly) cited. And of course academia and publishing are both full of book fetishists — people who genuinely love reading books, objectify them, love bookshops, love the heft and feel and smell of books, lap up articles about how anonymous little grey Kindles can never compete etc,. etc. (Disclosure time — my house and my LSE study are both packed with thousands of the blighters too). So, just as horse cavalry continued to be funded by armies and nostalgic politicians long into the era when barbed wire and machine guns made them completely useless, the illusory position that paper books could still compete in a digital world was maintained. With what results? I am a great believer in the importance of teaching in conditioning and colouring the whole of academic life, research included. In the social sciences, unlike the STEM subjects, very few academics are funded just to do research. Full-time researchers are far fewer in the social science (10 per cent of staff, as opposed to 35 per cent in the STEM subjects). And almost all full-time researchers are younger folk on soft budgets and short-term contracts. The social sciences also constantly change, with the time-lag from research frontier to teaching use being correspondingly far shorter than it is in STEM subjects. So for better or worse, what gets taught in our disciplines influences how social scientists see their subjects quite broadly and deeply. As ‘intermediate text’ and professionally read books increasingly stopped being set for courses, even for specialist courses, and only first year textbooks remained, so the academic status and relevance of books as whole declined across the social sciences. Because we set only or mainly journal articles in our teaching, and increasingly also discussed only them in classes and seminars, so we increasingly read only or mainly articles; and books dropped out of sight. In parallel, across the social sciences the ‘scientization’ of many disciplines was proceeding apace on many different fronts (allegedly driven by ‘physics envy’ in fields like economics and political science). Whatever the reasons, scientization often had consequences inimical for books, an artefact increasingly beloved only of disciplinary ‘obstructionists’ and reactionaries. In the UK a long series of bureaucratically structured ‘research assessment’ exercises (the RAE) led up to the current Research Excellence Framework (REF) in 2014. All were driven by a Treasury concern to demonstrate that the specific amount of money pumped into research support in universities was delivering results. Universities ensured that this was denominated in the form most pleasing to academic-bureaucrats (let’s call them ‘bureaudemics’) – that is, articles in prestigious or international uber-academic journals, whether or not these papers were ever subsequently read, used or cited by anyone. Journals responded by publishing more (often unreadable and unread) stuff. In bureaudemic terms, books were too hard to assess – each of them was so sui generis and so unique. The myriad RAE panels, involving hundreds of senior academics who should have known better, maintained the pretence of ‘reading’ (i.e. eye-balling) 200,000 research ‘outputs’. But everyone involved knew perfectly well that these mass-manufactued judgements were just going on journal reputations for articles (easy to do with the actually meaningless averages of journal ‘impact factors). When it came to books the bureaudemic process relied on unspoken and unexamined biases about types of books and the reputations of publishers when it came to books. So an obscure monograph with an Oxbridge university press (a dwindling numerous product) would always rate a top mark, but a book from a (shudder at the thought) ‘commercial’ publisher must be less ‘research-based’. Over time in the UK the numbers of books submitted to the RAE progressively shrank as these bureaudemic pressures cumulated. If books were hard for panels of bureaudemics to assess, book chapters were impossible – they were steadily excised from the sacred ‘4 items’ to be submitted to the RAE. The number one casualty were chapters in edited books, which moved from being a well-used and well-respected format in the soft social sciences and humanities especially in the late 1980s, to becoming an increasingly suspect offering. To the rushed readers on RAE panels, and increasingly in the eyes of promotion committees within universities, hard-to-assess chapters in books increasingly smacked of an effort to evade peer review, by publishing with mates instead of going through the rough and tumble of journal submissions. Of course, the bureaudemics in many fields also knew that knowledge of chapters in books in academic professions was anyway slender. Because, of course, chapters in paper books have become less and less visible in the digital world. The proprietary (but hopelessly out of date) bibliometrics systems defined in the 1980s, like Web of Knowledge, covered only journal articles, ignoring all forms of books and book chapters (just because they were unimportant in the STEM world). The enormous benefit conferred on the academic community by Google Scholar did begin to redress this, covering both books and book chapters along with articles. But even here, chapter were so numerous and so untagged that they were hard to track Chapters had very low initial audiences compared to journal articles circulated in print form to many professional academics and publicized through email alerts. For chapters in edited books though, unless you could physically handle the paper book in a bookshop or a conference, you had no way of knowing they were there. Even publishers’ catalogues now rarely give complete titles and authors for chapters. Google Books, another extraordinary gift to academia from Messrs Page and Prin, functioned well at the whole book level, but it was not indexed for chapters. So the pathway to uncited publications lead increasingly broad and true to chapters in books. And as citation metrics began to become more important in academia, so the lesson for any remotely ambitious academic became plain – don’t write chapters in books. Who publishes what in the social sciences and humanities now? All of this brings us to where we are now in the social sciences and humanities, the heartlands of book and chapter publishing. For a random sample of UK social scientists across twelve disciplines, a research team at LSE tracked all their publications. Just over three fifths of these outputs were journal articles and a fifth were books, book chapters or edited books. 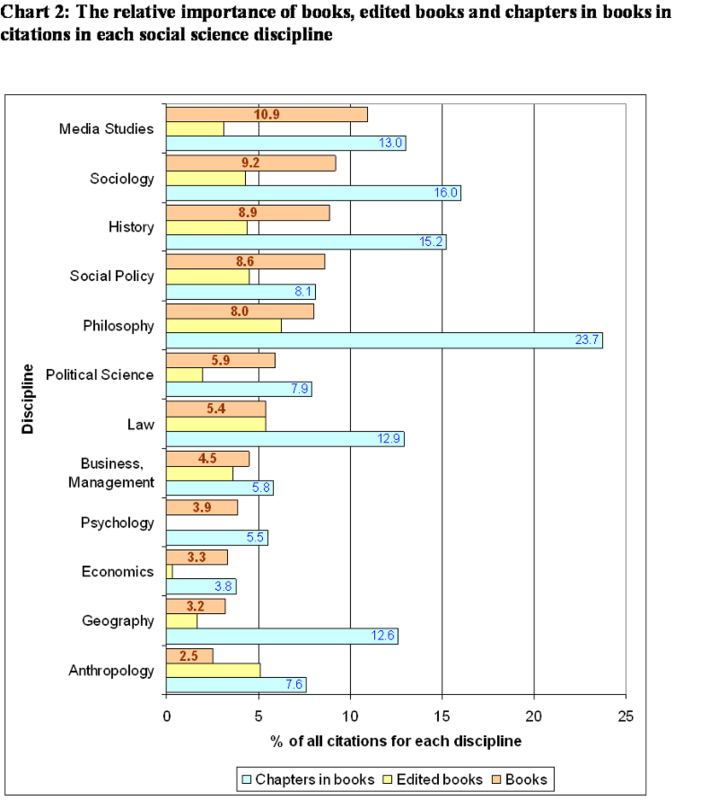 We next looked to see how citations to these outputs in Google Scholar and Web of Science were distributed across disciplines. My first Chart below shows the breakdown of results for all forms of book outputs versus journal articles (taken from my co-authored book The Impact of the Social Sciences, p. 43). In economics and psychology there were eight times as many citations of journal articles as there were of books, but in sociology and media studies the ratio was more like two to one – with the remaining social sciences spread out in between. In philosophy and history which are predominantly in the humanities, book outputs were also as or more important than in sociology in terms of citations. However, the data above put together all citations to three different kinds of book outputs – authored books, edited books and chapters in edited books. In my second Chart below I instead look at citations to these different kinds of outputs separately, and find that there are some sharp variations (again taken from my co-authored book The Impact of the Social Sciences, p. 44). The importance of whole books is shown in orange and the disciplines are arranged in their ordering on this dimension, with media studies and sociology at the top and with geography and anthropology at the bottom. 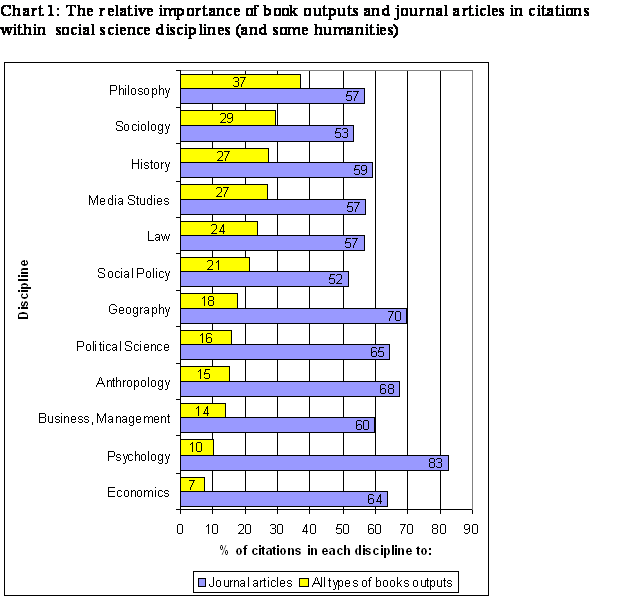 Edited books are cited in a fairly standard way across most disciplines, but are absent or almost absent in psychology and economics. Chapters in books fluctuate sharply in importance. They remain most cited in philosophy by a long way, followed by sociology, media studies, history, law and geography. Book chapters are least cited in economics, followed by psychology and business studies. So this is where we stand today in the social sciences and humanities, at a very bad pass for books and even more for edited books. But luckily the story does not end there, because many of the trends of the last two decades have now begun to change. We have in short reached a turning point, a moment in history when a renaissance of books’ influence can be foreseen across our disciplines. The key to this change is that books stop being only or even primarily paper products, and make the transition to ebooks and other digital forms. Five main developments give some basis for optimism. First, publishers like Oxford University Press are now releasing some student-accessible books and textbooks in great formats. Your library subscribes to the ebook and then students can download all the chapters in PDF form and use them in just the same way as journal articles. Suddenly your whole class or seminar group has access to all of the book, in class, making different forms of teaching feasible. Second, other enterprising publishers are beginning to realize that the marketing effort involved in trying to solely sell individual books as individual entities is just too hideously expensive to ever be viable in the digital age for products as low-selling as academic monographs or perhaps some intermediate texts. But supposes that a publisher builds up a large library of good quality books, with good pre-screening and peer review of book manuscripts or proposals at the outset. Why should book publishers be any differently situated from journal publishers here? Libraries buy all journals sight unseen – they know what articles were published in the past, but not what will be published this year. So the buy is made on the reputation of the journal, not on its precise contents. Nowadays university libraries rarely even pay individual journal subscriptions, but instead purchase a whole collection of journals for an overall fee. In the same way, if an academic publisher has a good reputation, why shouldn’t they essentially market a whole library of books to universities in advance? The LSE Library has recently signed a deal with Palgrave that gives its (no doubt) lucky students and academics complete ebook access to the ongoing Palgrave library of monograph books across the social sciences. You scan the collection and can download completely free whole books. So far this is just for the current year, but in the space of an hour I found and downloaded six great books that I’d thought about buying or borrowing but never been able to afford the time or money involved. If this far-sighted model unrolls into the future, it could dramatically increase usage of their research books, and not just by researchers and PhD students but on specialist courses too. Third, the combined rise of ebooks and tablets and phablets (phone/tablet hybrids) the is going to have a huge impact on academics’ and students’ book-buying behaviours across the social sciences as book prices begin to fall. Already my reading list this year includes some serious books that students can pick up on Kindle for very low prices. Social science students have a huge demand for books that has been particularly suppressed year after year by cripplingly high book prices in the UK, Europe and (most of all) Australia. With paper production and book retailers taken out of the price of books, there is simply no justification for the current prices of academic ebooks. The laws of supply and demand predict with infallible logic that lower prices will lead to some increased sales, but how much? The ‘price elasticity of demand’ has always been assumed to be steeply curved, so that lower prices produce only slightly more sales. But we know with ebooks that users are already reading many more books than people who stick with paper books (25 books a year for US e-readers according to Pew research, compared with just 15 for paper book readers). My own view is that student and academic reading is best thought of as denominated in terms of Starbucks medium lattes, currently costing £2.50 in the UK. So an academic book at £25 is ten lattes – a big decision that you will probably put off buying online or in the bookshop. An academic book at £50 is 20 lattes, so a ‘joke’ price that clearly only an institution will pay. But suppose an academic or serious book instead cost £5, as four or five books on my reading list do this year – that’s two lattes? At this level almost all university readers will think it worthwhile to buy a copy for even a single week’s topic. 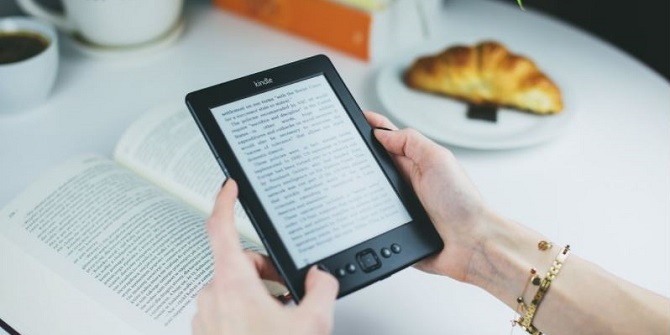 ‘Instant’ buying ebooks on a whim is especially likely because it can be accommodated costlessly on your PC, IPad, Kindle or even a big screen phone, without loading up your backpack or bulging your bedsit’s shelves (for students), or adding to the hundred of books already overloading your shelves (for academics). At three lattes (£7.50) the student and instant (‘whim’) purchase market drops off, but I’d expect the academics to hang on in there. At four lattes (£10) a copy, student demand for ebooks would be back down towards to current behaviours, and academic purchases will halve, but still be much greater than they are now. The recent rise of ‘popular social science’ books has demonstrated some huge sales gains from lower prices and better writing, both effects that I think could follow more generally if academic ebook prices can be pushed down towards fiction market levels, and if standards of academic communication can be improved. 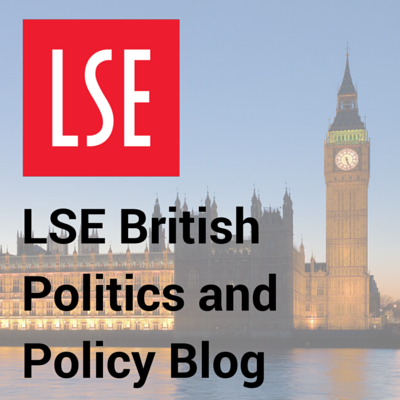 The demand from a wide range of people for accessible social science knowledge has been demonstrated by growth of readers for properly edited social science blogs – like those at LSE, such as the LSE Impact blog covering higher education, or LSE Review of Books covering a wide range of social science and humanities books. Fourth, the renaissance of books has been strongly fuelled by increased attention in academic life to citations, as evidence of actual usage of academic work. Books have a strong long tail effect, cumulating citations across the years, increasingly visible now via Google Books, Amazon and university libraries. So it is natural that across the soft social sciences and the humanities, academics’ citation counts are headed by their whole books. By contrast, the citations for academic journal articles in the social sciences and humanities is typically low to begin with, kicking off two years after publication and rapidly shutting down after around five or six years. Later citations only accrue in any large numbers to a very few ‘classic’ articles. There is no book-equivalent ‘long tail’ effect with journal articles. So, if your field offers a choice between effort in books or effort in articles, many academics would best maximize their cite counts by adjusting the balance of their academic effort more towards whole-books and less towards journal pieces that will be read or cited by few readers. Even for book chapters the tide has begun to turn with edited books increasingly available in ebook form. This overall trend is strongly reinforced by the emergence of greatly improved means of finding and assessing book chapters, primarily because new digital tools that make available the full range of academic outputs for any academic author. Especially important here are Harzing’s essential free-to-download ‘Public or Perish’ software; Google Scholar Citations, which provides a cites-counted intellectual biography of anyone serious in academia; and the key networking site for academics, ResearchGate. If you’ve not got your own Scholar Citation or ResearchGate entries going yet, make that today’s task – it only takes five minutes to make all your publications visible to the whole world! Citations alerts are also easy to set up that tell you every time your work is cited by anyone else in academia, and every time another author whom you are tracking publishes anything new. Both are very potent ways of costlessly keeping up-to-date across all your research topics. Fifth, books are back because now impacts count. In the USA the National Science Foundation has been forced by Congress to stop funding so much esoterically specialized research in favour of projects with traceable ‘real world’ impacts. And in the UK the REF 2014 exercise now allocated a fifth of all research funding to external impacts as demonstrated by an ‘impacts template’ and ‘impact case studies’. A top-rated impact case study could attract funding of between £500,000 and £650,000 over five years for successful departments. In achieving external impacts, the ability to reach out to wide audiences, and audiences across national borders, in freely downloadable well-written blogs and cheaply available, well-written serious books will be crucial. What is certain is that journal articles will be important here only as quality-certified backstops for reputation, not as real agents of disseminating ideas. Even if they were free, journal articles are offputting for almost all non-academic readers – because they are mostly so badly written, and stick with clearly obsolescent design formats, such as obtrusive ugly footnotes or Harvard referencing, instead of the simple and clean unobtrusive URL referencing developed by blogs. After decades of alleged effort journal publishers have signally failed to modernize their graphics (still mostly black and white in an era when colour printing is otherwise pervasive); still cannot handle URLs consistently, or organize effective, one-click cross-referencing; and of course have no social media functionality, cannot handle video or sound elements, don’t allow the logging of reader comments or corrections. In these and just dozens of other ways, journals articles say ‘out-of-date, ivory tower product’ to anyone who lives in the normal world outside universities. If they are so poor now, and have stayed so poor for so long, it’s probably about time to give up on them as anything more than a quaint form of certification, akin to a degree certificate handwritten on parchment and embossed with a wax seal. Such things may not die out completely – but you do see them less and less as the years roll by. As human civilization moves increasingly towards becoming a single globalized society, with a common global technology base, whose overall governance and performance in planet-management are increasingly complex and salient, so I am convinced that the global market for good quality social science and humanities knowledge will increase. This knowledge will be immediately available in short form free across the Web in well-communicated multi-author blogs. The long form versions will appear also in those academic journals that make the essential transition to a free-to-read, pay-for-publication model, instead of charging the current horrendous (Elsevier-style) subscription prices. Cheap-form academic ebooks and other serious ebooks will provide the other long-form versions, in formats and styles that are stylistically better, properly designed and far more flexible, colourful and graphics-based than the current prevailing styles. In my view, the volume of academic books sold will grow very fast, so long as consumers and governments can persuade publishers to give up on their bust single-book-marketing strategies. If other major book publishers do not very soon set up the same functionality that Palgrave have given to their books (described above), then it will only be a matter of time before brand new academic presses ones are set up to pursue the ‘whole collection’ marketing of both research and ‘intermediate text’ books in solely electronic forms for the university market worldwide. 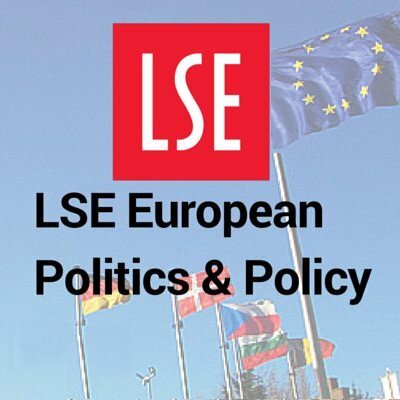 Universities currently without an academic press – notably LSE – will need to re-examine their stance as the viability of this e-only, collections-based, well peer-reviewed model of publishing becomes ever clearer. Even established universities in the publishing status quo will come under pressure to match the low costs, low prices and innovations of the new models. And there will be for-profit entrants to the academic ebook/collections-marketed model too, some of whom (perhaps Amazon or Google themselves? ), have the scale and market nouse to deliver really big on modest capital investments. The consequences will be very beneficial. 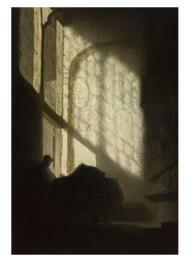 The much proclaimed and lamented ‘death of the monograph’ will be indefinitely postponed, indeed decisively reversed. A balanced portfolio of research books and intermediate texts will be essential for the collections e-marketing model, and research universities that control much of this content will gain a useful value-stream. For the same reasons, I expect the current drift away from ‘big book theses’ towards ‘papers model’ PhDs in the social sciences to slow and gradually reverse. If the monograph is not dead, but alive and disseminated better than ever before in refereed ebook form with supporting blogs and Twitter feed, then the big book thesis too revives. Lots of related information for the social sciences (and some overlap areas with the humanities, included above) can be found in : Simon Bastow, Patrick Dunleavy and Jane Tinkler, ‘The Impact of the Social Sciences ’ (Sage, 2014) or the Kindle edition. You can also read the first chapter for free and other free materials are here.